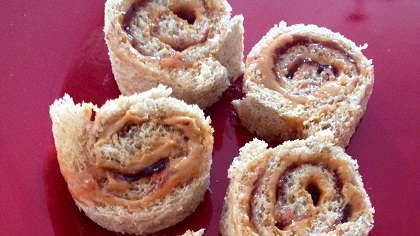 Making these PB&J rolls takes an already loved snack and makes it even more fun to eat. Lay bread slices together, overlapping by 1/4" to form a seam. Press your fingers into the seam to form a tight seal. Using a rolling pin or large plastic cup, roll the bread slices into a flat, rectangular shape. Spread peanut butter and then jam over bread. Carefully roll up to form a log. Using a sharp knife (with mom's help) cut the log into 5 or 6 spirals.